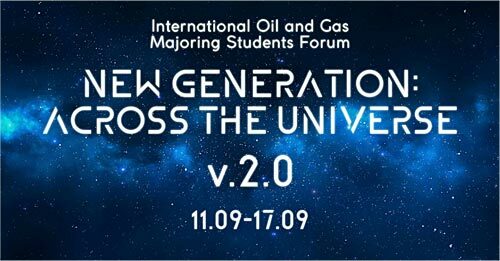 From 11th till 17th of September, 2017 the 2nd International Oil and Gas Majoring Students Forum “New Generation: Across the Universe” will be held at Gubkin Russian State University of Oil and Gas (National Research University). The goal of the Forum is to gather the most outstanding students of different oil and gas majors from the world's best universities to give them a unique opportunity to share their ideas and experience and to solve the problems of world student society as well as to determine the future tendencies of the scientific and technical development of the global oil and gas industry. For the second year, the Forum is supported by the Society of Petroleum Engineers (SPE), World petroleum Council (WPC) and International Gas Union (IGU). Last year the rector of Gubkin University Victor Martynov, deputy minister of Education and Sciences of the Russian Federation Veniamin Kaganov, president and chairperson of the Board Directors of PetroSA company Nosizwe Nokwe-Macamo, president of Schlumberger company Gokhan Saygi, vice-president of Weatherford Russia company Fayaz Kamalov took part in the Opening Ceremony of the Forum. The vice-president of the World Petroleum Council Anatoly Zolotukhin was the moderator of the Forum. “Gubkin University is unique in our country and in the entire world just as unique as the petroleum industry. This event has a great value for making contacts and further collaboration. Hopefully, we will manage to solve the current problems of the oil and gas industry, as well as get acquainted with Moscow and culture of Russia. Surely, after this event you will wish to learn more, visit cities and countrysides of our great and immense Country,” deputy minister of Education and Science of Russian Federation, Veniamin Kaganov, says. In 2016, the Forum was attended by 117 students from 52 countries and 40 universities from all over the world. Through six days delegates took part in different activities: solving a business case from Schlumberger, attending plenary sessions, conducting dialogue with oil and gas companies and government representatives in a press conference “Development of the youth BRICS tendency in the oil and gas industry”, visiting “Career Pathways Fair”. A fruitful cultural program followed: visiting the Moscow Kremlin Museums, ice skating class, the festival “Cuisines of Russia” and “Miss University 2016” Annual Competition. One of the significant events became the trip to Gubkin University “Zaluchie” camp, where guests saw real Russian winter, got acquainted with nature of a protected forest, had fun and made friends. Also, the Organising Committee will be glad to consider proposals on cooperation.